If you’re a tech-savvy person who needs to keep their Laptop and gadgets safe while traveling, you’re at the right place. It’s getting more common for luggage brands to make carry-ons with a special compartment for your laptop. I’d imagine that in the near future, a laptop compartment will be in all carry-ons. However, today there are actually not that many choices that offer additional space for your laptop. I’ve done the research for you and here I’ll share my nine picks of the best carry on luggage with laptop compartment. My number one priority when choosing a carry on is an easy to reach, padded laptop compartment, as I often write on my laptop in cafes, lounges and during flights. Also, the luggage brand plays a crucial part in choosing a carry on that will last. I’ve also created a comparison of the best luggage brands. If you have a 17-inch laptop, you should make sure that the Laptop compartment offers enough space. For instance, I use a 15.6-inch laptop, but some have 17-inch laptops, which are hard to squeeze in a carry-on. Also, make sure that the compartment is padded and comfortable to reach, preferably with smaller compartments for your chargers and documents. A carry-on with a lifetime warranty that’s friendly to your gadgets. What else could you want? If you’re serious about flying, this one is your best bet. It’s incredible How Fribourg managed to squeeze so many features in this carry on while keeping the price so low. If you have the budget, the Platinum Elite offers more features than its little brother Crew 11. It’s the best option for your business trips. How do carry-ons differ from checked luggage? The Travelpro Crew 11 20-inch carry-on is easily one of the best carry-ons that you can purchase. Although this one doesn’t have spinner wheels, the lifetime warranty and superb customer reviews outweigh all of the negatives. If you’re a serious frequent flyer, this might be the case of your dreams. The padded front pocket allows storing laptops of up to 15.6 inches. Also, the front pocket is RFID protected, which means that nobody can scan through this pocket and your data is secure. What I love about this carry on is that it has a built-in USB port with a dedicated power bank, allowing you to charge your devices on layovers easily. Other benefits include a lifetime warranty and an expandable width for more room in the main compartment. The full dimensions of this carry on is as follows: 21.5 x 15 x 9 inches (including wheels and handles). This bag was made for the serious frequent flyer who needs to protect their devices and have them on hand at all times. Made from very durable materials and backed up by a lifetime warranty, Travelpro Crew 11 won’t let you down. The Fribourg Premium 20-inch carry-on can hold a 17-inch laptop inside the front pocket. If you have a widescreen laptop, this might be the right option for you. It’s made from a durable and lightweight ABS material and comes with a 3-year warranty. The price is really low for all the features that it offers, including a combination TSA approved lock, for the safety of your items. It also includes a scratch-resistant rugged paint and 360-degree spinner wheels for smooth movement. The total dimensions for this carry on are as follows: 22 x 14 x 9.5 inches (Including spinner wheels and handles). This carry on is one of the cheapest available and offers a lot of features that similar competitors don’t. For instance, a TSA approved lock and a front compartment that fits a 17-inch laptop (which is the main benefit against its alternatives). The Travelpro Platinum Elite 20-inch carry-on is easily the best carry-on included in this list but comes with a hefty price tag. Nevertheless, if the price isn’t an issue, this bag is excellent for serious business travelers. Also, it offers a few upgrades from the cheaper Travelpro crew 11. The padded front pocket allows storage of up to 15.6-inch laptop and is RFID protected. It means that nobody can scan through your carry on and your credit cards and data are protected. Few smaller compartments allow storage of documents and chargers. Also, there’s a removable TSA compliant bag for liquids, and the interior is very well designed for smart packing. Its main benefit is the spinner wheels, which the Crew 11 lacks. Also, this case has a built-in USB port with an internal power bank and lifetime warranty. It’s made from a high-density nylon fabric that resists stains and abrasions. The full dimensions of this carry on are as follows: 22.5 x 14.5 x 9 inches (including spinner wheels and handles). If you’re willing to pay a few hundred dollars for your carry on, spend it on Travelpro Platinum Elite. This carry on easily beats the competition. You will get a carry on with smart packing capabilities for your gadgets. Also, it’s made from premium materials and is backed up by a lifetime warranty. There’s a reason why the Delsey Helium Aero 19-inch carry-on is the most popular model of Delsey (Also, the most reviewed in this list), a well-known luggage brand with over 70 years of experience. It’s a modern and stylish companion for your everyday travels. The front compartment is designed to fit most accessories as well as a laptop with maximum 15.6 inches in size, giving you easy access to your belongings. This carry-on is made from a durable polycarbonate material. According to Delsey, it’s the same material used in bullet-resistant windows. It’s very durable, yet flexible enough to not break. Other notable features include spinner wheels for smooth movement, and expandable width, that allows another 2 inches in width. TSA approved locks are also included for double safety. The dimensions of this carry on luggage with laptop compartment are as follows: 21.75 x 13.75 X 9.75 (Spinner wheels and handles included). The Helium Aero is a brilliant choice for business travelers with an affordable price tag. Also, this hardside luggage is excellent for packing suits, due to its zippable function to lock down your contents on both sides. 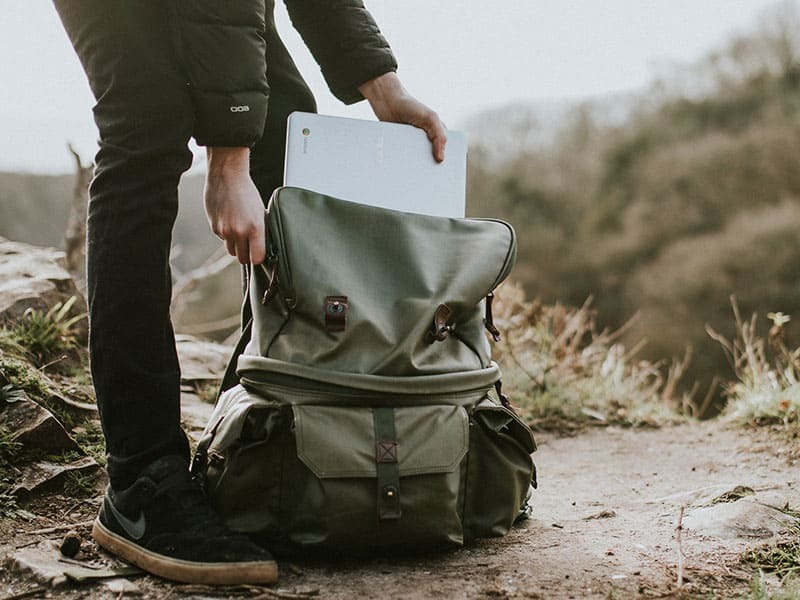 Although Rockland isn’t famous for their quality, this hardside laptop carry on bag has better reviews than some alternatives that cost twice as much. If you’re tight on a budget, the Rockland Titan 19-inch carry-on of the best options that you can get. It comes with a fully padded front compartment that fits laptops up to 15.6 inches in size as well as other accessories. Also, it’s made from a lightweight ABS material, that’s flexible and strong. Other features include spinner wheels for easy movability, expandable width for more storage space and a 5-year limited warranty. Its overall dimensions are as follows: 22 x 14 x 9.5 inches (Including handles and spinner wheels). Rockland Titan isn’t ideal for a lifetime usage, but if you’re short on your budget, it’s an excellent choice. For this price, it’s tough to find other good alternatives with decent quality. If you’re looking for a small carry-on that fits almost all airlines, this is your best bet. The Samsonite Silhouette Sphere 17-inch carry-on has superb customer reviews and is the most popular carry-on by Samsonite. It features two smaller front pockets for your passport and chargers, as well as an inside padded compartment for your laptop that fits up to 15.6 inches. Although it’s quite tiny, the main compartment seems spacier than some larger alternatives offer. The total size is 19 x 14 x 8.5 inches (Spinner wheels and handles included), which is allowed by most airlines. It also features unique spherical spinner wheels by Samsonite for improved moveability. I really like the removable organizer that comes with this carry-on. It’s fitted inside the main compartment, and you can store your toiletries, chargers and other stuff there. You can take it out by unclipping it from the main compartment. The silhouette sphere laptop suitcase carry-on is one of my top choices for carry-ons with a laptop compartment. Mainly, because it’s very well reviewed, offers large packing space despite its size and has a removable organizer. The Victorinox Avolve 3.0 20-inch carry-on is lightweight, easy-to-move laptop carry on that fits in most overhead compartments. It has a high-quality cover with the frame made from polycarbonate and the outside layer of quality fabric. This carry on features a padded front pocket that fits up to 15.6-inch laptop. It also features another smaller front pocket for your documents and smaller items. Victorinox quality is backed up by a 10-year warranty. When a manufacturer offers five or more years, they’re usually confident about their products. Other features include 360-degree spinner wheels for light moveability, lightweight frame, and expandable width for more packing size. The full dimensions of this carry-on are 21.65 x 13.78 x 9.06 inches (Spinner wheels and handles included). At the semi-high price, it’s main rivals are Travelpro crew 11 and Samsonite silhouette Sphere 2, with this being a similarly good option. It’s slightly smaller than Travelpro but bigger than Samsonite. Regarding quality, all three are just amazing. If you want a middle-sized carry on that lasts, this is your best bet. The Travelcross Boston 19-inch carry-on is a very well reviewed and affordable spinner laptop carry-on, a rival of the Fribourg Premium 20-inch carry-on. The main difference is that this one is slightly smaller, doesn’t have TSA approved combination locks and has a somewhat different design. The front pocket allows storing a 17-inch laptop. Other smaller compartments are included for secure storage of documents and chargers. The main compartment is quite roomy as well. Other benefits include smooth spinner wheels for easy mobility, the bag is designed to fit in most overhead bins, and is made from a premium ABS material, that’s quite strong and flexible. The overall size is 21 x 15 x 9 inches (Including spinner wheels and handles). If you have a 17-inch laptop, you’re looking at either Travelcross Boston or Fribourg premium carry-ons. This one has slightly better customer reviews, however, doesn’t offer a TSA approved combination lock. Both are similar, and this can be a great alternative if you don’t like the Fribourg. Have you heard of Xiaomi yet? It’s a giant company from China that specializes in making many products, ranging from mobile phones to luggage. It’s the most popular luggage brand in China and quickly starting to break into western markets. The Xiaomi Passport Business 20-inch carry-on is affordable and offers many solutions for your gadgets. The front compartment allows storage of a 15.6-inch laptop and an iPad. In total, it has seven different size pockets for storage of your smaller items, like your passport, power-bank and a charger. The main compartment has some smart zipped pockets for your underwear and personal essentials as well as cross straps to keep your luggage in place. It offers a double TSA lock, which means that with one lock you can unlock both compartments. Other notable features include silent spinner wheels for easy movability and a frame made from a German bayer polycarbonate. The full size of this carry on is 23.1 x 15 x 9.7 inches (Including spinner wheels and handles). The Xiaomi passport carry on is yet another affordable carry on luggage with laptop compartment, offering many smart packing solutions for your gadgets. What I like most about it is the sleek and modern design. It’s meant for the average traveler who needs to protect their tech in a secure and easy to access place. Some of you may not be familiar with what carry on luggage is. Basically, it’s luggage that is allowed to be taken with you on the airplane. Other than carry-ons, there’s also checked luggage, which has to be checked and stored inside the airplane’s luggage compartment. Most commonly backpacks, duffel bags, are carry on luggage are used as carry-on bags. The main restriction is that your bag has to be within a certain size and weight limit to be allowed taken inside the airplane. Also, you can’t pack some items in your carry-on. When we refer to a carry-on in this article, we’re referring to luggage that fits the airline carry-on restrictions. Not a backpack or a duffel bag. There’s a common problem with carry-on luggage that you should know about. Very often, when you’re buying your luggage online, the actual size is different. It may not include the spinner wheels and handles. Sometimes it’s mentioned but in small lettering. All of the carry-on dimensions in this list have the wheels and handles included. Unfortunately, there’s no standard set for carry-on luggage. The allowed size and weight varies from airline to airline. To be sure that your bag doesn’t have to be checked, you should always check the airline limits for your flight before packing your case. You can do that by checking the airline companies website or by looking at this post that covers most airline restrictions. To be sure that your carry-on is accepted by most airlines, you should look for a bag that fits most airlines. However, often a few inches above the limit are allowed onboard. 22 x 14 x 9 is accepted by the four biggest airlines: American Airlines, Delta Airlines, Southwest Airlines, and United Airlines. Some European international airlines have stricter rules, and the size limit may be smaller.